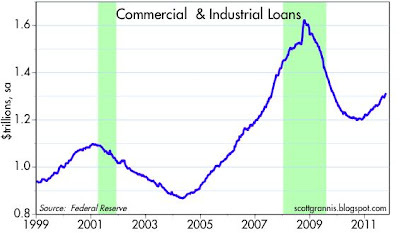 People continue to complain that banks are not lending money to small and medium-sized businesses (the ones too small to tap the credit markets directly), but the facts continue to say that is not the case. As this chart shows, Commercial & Industrial Loans at all U.S. banks have been rising for the past year, and the rate of growth has been accelerating of late. Over the past year, C&I loans are up 8.9%. Over the past six months they are up at a 10.9% annualized pace, and over the past 3 months they are up at a blistering 14.5% annualized pace. At this rate, banks are expanding their business lending by about $3.4 billion every week. We're starting to talk about some serious money here. Meanwhile, the broad money supply (M2) is up at an unprecedented annualized pace of 15.7% over the past three months. In recent years, despite the severe economic slump and the painfully slow recovery, M2 has greatly exceeded its 6% average annual growth rate since 1995, thanks to the Fed's willingness to accommodate the extraordinary demand for safe-haven cash in the wake of the Lehman and Eurozone panics. I would note that the "bulge" in M2 growth that began last June, when the Eurozone sovereign debt crisis really started to heat up, has stopped getting bigger. I estimate the extra demand for M2 was on the order of about $400 billion. That suggests that the panic flight out of Eurozone banks is not accelerating, and that is at least one bit of good news. 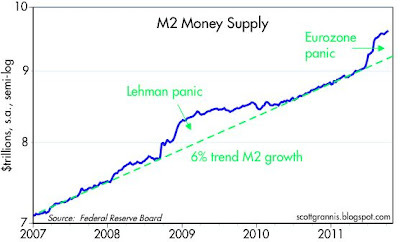 In any event, it's worthwhile noting that since just before the Lehman crisis and subsequent global financial panic, the M2 money supply has increased by $1.83 trillion. On average, that works out to $11.3 billion every week, or about $1.6 billion every day. So far, all that new money has not had the impact on U.S. inflation that many would have expected, and that's due to the fact that the world's demand for money has expanded roughly in line with the Fed's willingness to supply additional money. But there continue to be important signs that the Fed's monetary policy is on balance accommodative (e.g., $1700 gold, the extremely weak dollar, and very strong commodity prices), and thus that higher inflation awaits us. That will especially be the case if and when the Eurozone panic subsides and the demand for safe-haven cash begins to decline. If the Fed doesn't soak up all the excess liquidity that will be the by-product of better economic times, then we could be looking at a significant rise in inflation even as economic growth picks up. The September readings for the Personal Consumption Deflator were generally in line with expectations. As this chart shows, it's hard to get excited about either too much or too little inflation at this point, since the Fed's preferred measure, the core deflator, is well within its target range, and the headline measure is only a point above. 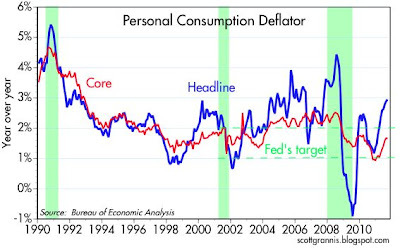 Over the past six months, the core deflator has increased at a 2% annual rate, while the headline measure has increased at a 2.4% pace, so on balance we can say that inflation is somewhat on the high side, but not by enough to warrant any change in monetary policy; no changes, neither to ease nor to tighten, are called for based on these numbers. Since nominal GDP has increased 5% over the past year, deflation risks are essentially nonexistent. If there is another shoe to drop here, it is likely to be concern that inflation pressures are picking up, and that the Fed should pay more attention to exiting its quantitative easing strategies, rather than launching another one. 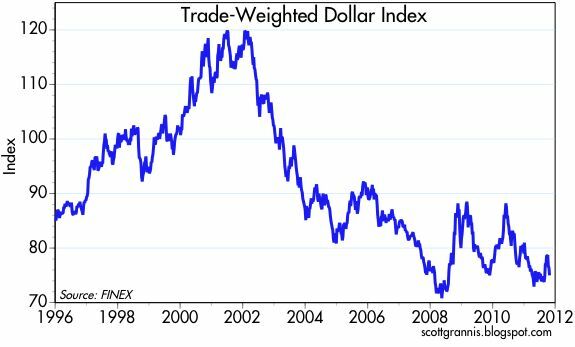 That case is bolstered by the renewed weakness in the dollar and the nascent pickup in commodity prices, which are still quite high from an historical perspective. Yesterday was a big day, even though the Europeans didn't do much to solve their underlying problem, which is governments that have grown too big and taken on more debt than they can service. Debt write downs and bank recapitalizations such as were announced yesterday help address the threat of bank defaults, and that in turn reduces the threat of systemic failure and an economic collapse. But they don't solve the problem. Eventually, Greece must either throttle back its government, or abandon the euro and return to the drachma, which would then mean a sizable devaluation and a significant decline in living standards for all Greeks. Either the public sector bites the bullet, or everyone does, because the market will no longer willingly lend government the money to continue its profligate ways. 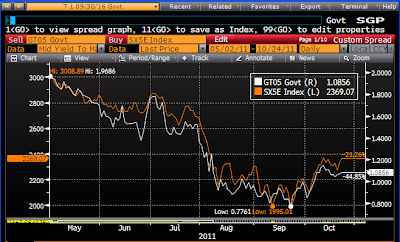 (The ECB may do so, of course, and the German taxpayers may also help, but that's only a stopgap measure.) And Italy, Spain, and Portugal must also adopt concrete austerity measures. As the top chart shows, 2-yr Eurozone swap spreads haven't changed much as a result of yesterday's debt accord, which makes sense since the accord was only the equivalent of a band-aid solution. 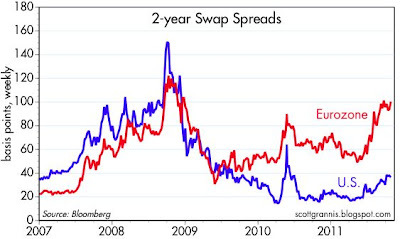 But 2-yr U.S. swap spreads are down from 37 bps two days ago to 30 bps today; that puts them firmly in "normal" territory. Conclusion: the threat of defaults and systemic disruption remains quite high in Europe (which makes sense), but the risk that problems in Europe could seriously disrupt the U.S. economy has diminished, and is relatively low. A growing U.S. economy can effectively trump the troubles emanating from the Eurozone. One of the biggest changes to come in the wake of yesterday's Eurozone accord was a sizable drop in the Vix index, which has come down from 45 earlier this month to 25 today. It's still elevated, but it's no longer in what might be termed the panic zone. 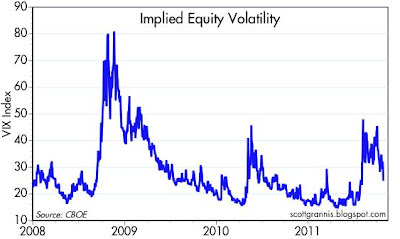 Investors are breathing easier, but they are still genuinely concerned about the outlook. U.S. equities have rebounded almost 17% from their Oct. 3rd lows, in part because the risk of a Eurozone contagion has declined, but mostly because the economic stats have shown that the U.S. economy continues to grow, and fears of an imminent double-dip recession were overblown. The chart above is one way to see this, since weekly unemployment claims have not deteriorated and look to be trending downward (claims are inverted in the chart), and equities had been priced to a deterioration that failed to occur. 10-yr Treasury yields have rebounded from an all-time low of 1.7% to 2.3% today, which is equivalent, as the chart above suggests, to pulling back from the edge of a depressionary abyss. 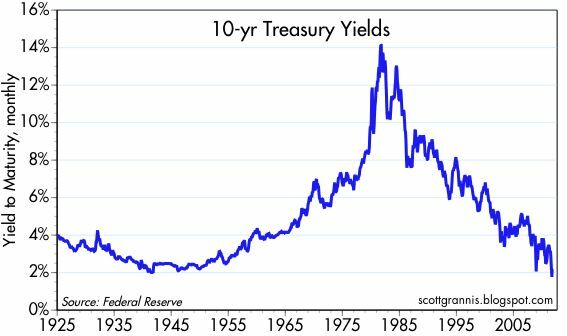 Yields are still extremely low by historical standards, but at least they no longer reflect a market that is braced for an imminent catastrophe—rather, a market that still worries that the U.S. may end up in a recession. 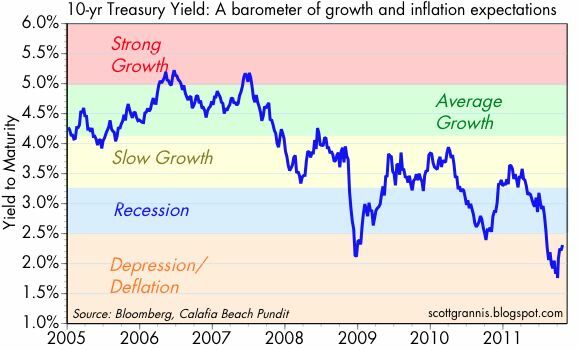 However, I think it's also likely that Treasury yields are depressed because of the ongoing troubles in the Eurozone, and are behaving more like a safe-haven than as a proxy for the long-term outlook for the U.S. economy. 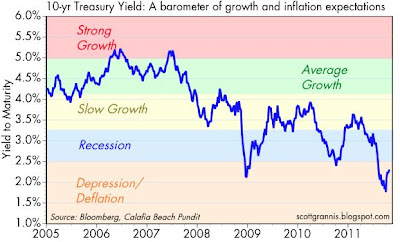 That's how I would explain the fact that equities display a measure of strength while Treasuries are still in recession/depression territory. 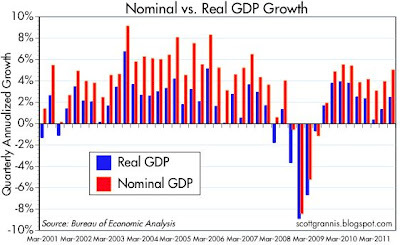 Here's a chart that shows the quarterly annualized figures for nominal and real GDP growth. 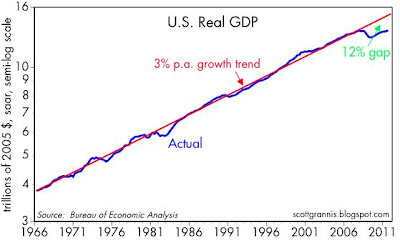 I've mentioned this before, but what strikes me again is how nominal GDP growth has been fairly steady since the recovery began, even as real growth has been quite volatile. Over the past year, nominal GDP growth was 5.0%, and that's actually a bit better than its 4.7% annualized growth over the past 20 years. There's a lot of talk these days (led by Scott Sumner) about how the Fed should target nominal GDP growth, and the recommendations typically call for a 5-6% nominal GDP growth target. Well, guess what, based on the last 8 quarters of GDP data, you could argue that the Fed has been doing almost exactly that. 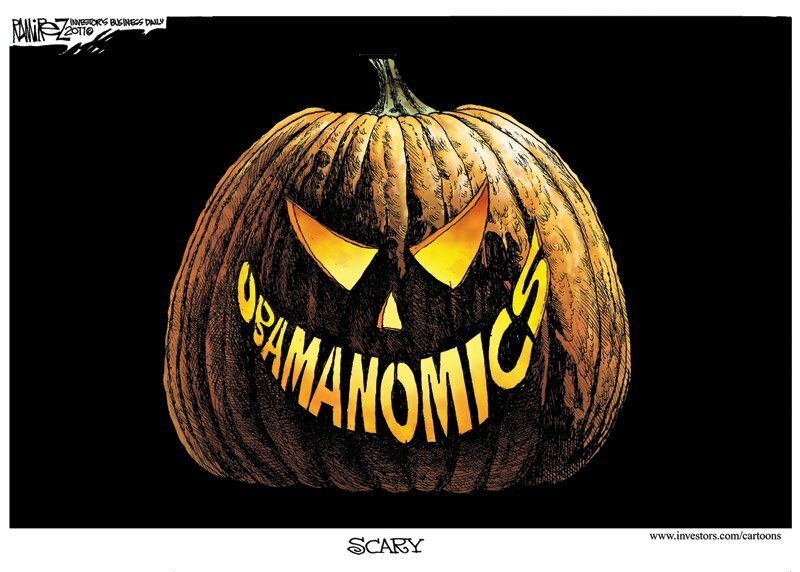 Problem is, of course, that even 6% nominal GDP growth is not going to fix the mess that this economy is in. 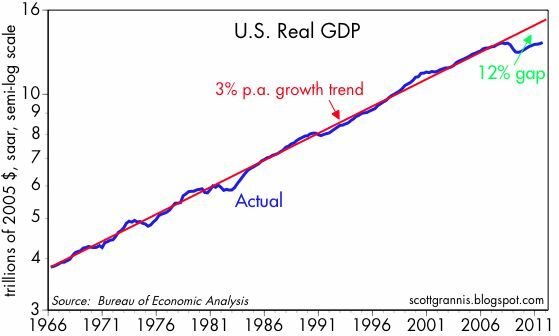 As the chart above shows, real GDP is still about 12% below its long-term trend. 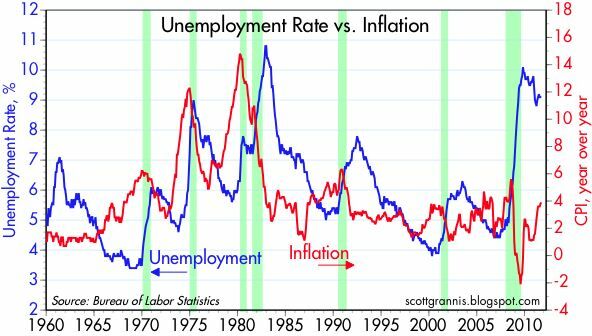 We would need quite a few years of exceptionally strong real growth (accompanied, no doubt, by at least 2-3% inflation) to get us back to a level of economic activity that would provide employment for the many millions who would like to work but can't find a job. So nominal GDP growth is going to have to be a whole lot more than 5-6% per year before the economy really recovers. So here's my question to the nominal GDP targeters: Do we need any special effort from the Fed to achieve the goal of full employment (e.g., QE3)? This chart would say "no." 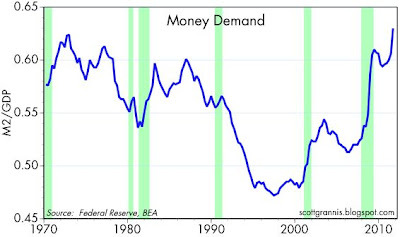 The Fed has already accommodated a huge increase in money demand via QE1 and QE2. 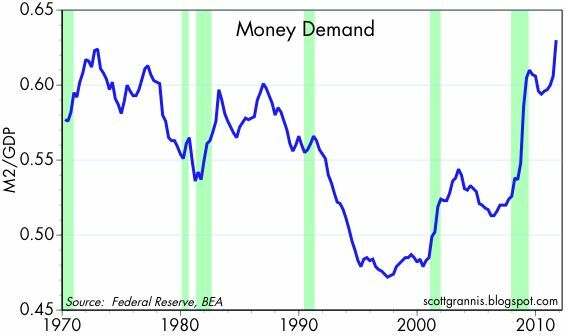 The surge in money demand has been the direct result of the waves of panic that have swept the global economy in the wake of the Lehman crisis in '08 and more recently the sovereign debt crisis. The current level of M2 could support a 20% increase in nominal GDP if money demand were to return to its pre-2008 levels. Thus, it's theoretically possible for the Fed to refrain from undertaking any further extraordinary easing measures, yet for the economy to regain full employment, provided one thing happens: the world regains its confidence in the future. That would reverse the huge increase in the demand for money that has built up in recent years, that would effectively finance a real and nominal GDP boom in the years to come. What we need is not more money, we need more confidence, and that can come from policies that reverse the errors of the past 5-10 years—policies that brought us the housing market collapse and the crisis of excessive, deficit-financed government spending. Those in favor of nominal GDP targeting argue, I think, that the Fed contributed significantly to the mess we're in by not easing policy enough. I disagree, since I don't see how a huge money dump could have offset the tremendous damage to confidence and underlying growth fundamentals that stemmed from at least a decade of fiscal policy negligence. The October 4th low in 10-yr Treasury yields (1.71%) was not only an all-time record low, but it also signaled the reemergence of the bond market vigilantes (finally!). In the past three weeks, 10- and 30-yr Treasury yields have soared by 70 bps. 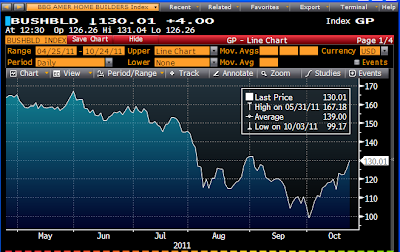 For those who owned the long bond on October 4th, this resulted in an almost 13% loss of value. For those who bought equities on October 3rd, this has resulted in an almost 17% gain. Wow. 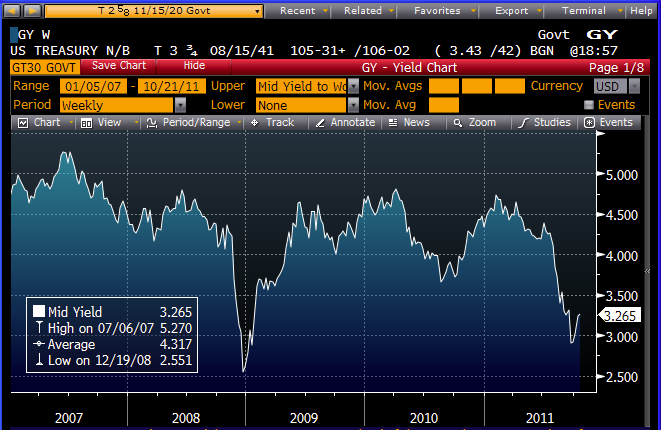 The action of the past three weeks eclipses the bond market rout that occurred in late June 2003. Back then it took the bond market a full month to push 10-yr yields up 70 bps. It also eclipses the dramatic reversal in yields that occurred at the end of 2008, when it also took a full month for 10-yr yields to rise 70 bps from their closing low of 2.05% on Dec. 30, 2008. What looked to many like a great defensive play against an end-of-the-world scenario just three weeks ago now looks like a very expensive mistake. And why? All because Europe may have figured out a partial solution to its sovereign debt crisis. Not a full solution by any means, merely a step in the right direction. I think this vindicates my oft-repeated claims that the market was priced to a catastrophe, and anything short of a catastrophe could prove to be very bullish for equities and very bearish for bonds. Here's a chart of 30-yr Treasury yields (weekly) that shows how the recent reversal is very reminiscent of the reversal that followed the plunge in bond yields at the end of 2008. Both periods were marked by extreme levels of fear, panic, pessimism, you name it. If we follow the same pattern in the months to come—if the policy and economic fundamentals continue to improve even just slightly—then yields could rise much more, and equities could enjoy a truly spectacular rally. In short, this market is not being driven by optimism, it's being driven by the realization that the outlook is not nearly as bad as many had feared. I'm traveling today so blogging will be brief and delayed. First thoughts: the news from Europe is good, but the crisis is far from over. It's good that Greek debt will be written down, but the haircut still seems timid, and we still need to see some austerity measures. But at least something is being done to address the problem, and that means the likelihood of catastrophe has diminished greatly. That is the key point: what we are seeing is much better than the market had been priced for. This chart of the ratio of the Vix Index to the 10-yr Treasury says it all. The outlook is now much better than it was just a few days ago. Stocks are up big, yields are up big, and the Vix is down big. The future is far from rosy, but it now looks like a catastrophic global meltdown is no longer very likely. Every day that goes by without a collapse of the Eurozone banking system and/or economy is a day the markets breathe a little easier, even if a lasting solution (i.e., genuine austerity measures and meaningful debt restructuring for Greece at the very least) remains elusive. The world can only be panicked about an upcoming default and financial catastrophe for so long; as time passes, people, banks, and institutions take steps to insulate themselves from the expected disaster, and that inevitably makes the impact—when it happens—less severe. Call it "panic exhaustion." The Vix index has been trading at elevated levels for almost three months now, and that's a long time. Hedgers get tired of paying huge premiums for options that don't pay off, while sellers of options feel better and better as time passes and they collect their option premiums. Taking risk becomes more attractive that avoiding it. 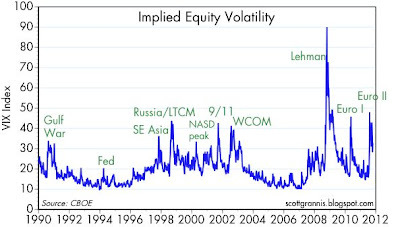 Fear continues to run high, and that is depressing the prices of most risk assets, but the passage of time without the fears being realized is the enemy. Eurozone swap spreads have been trading between 90-100 bps for almost two months, while U.S. swap spreads remain at levels that are more or less "normal." 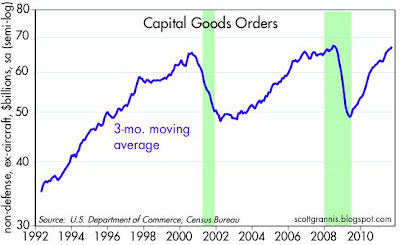 There has been no contagion to date, and the U.S. economy continues to slowly improve. Copper futures sold off in September as everyone rushed for the exits, but prices are coming back as economic life goes on and underlying demand remains relatively strong. 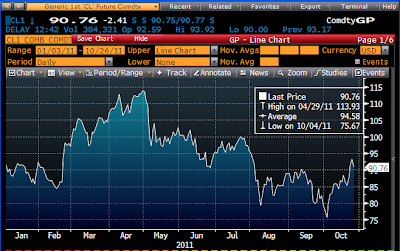 Same goes for crude oil futures, which have rebounded by a hefty 20% since the peak of the panic (October 3-4). This proxy for business investment spending continues to grow at impressive rates. New orders for capital goods are up at a 10.3% annualized rate over the past six months, and September orders were up much more than expected (2.4% vs. 0.5%). We've finally seen a new, all-time high for this series. This is undeniably good news, and it shows that businesses are indeed putting their record profits to work, albeit in a hesitatingly slow fashion: profits are up 50% from their Q2/08 levels, yet capex has only just broken new high ground. Yes, things could (and should) be a lot better, but the news today confirms that the economy is still growing and the fundamentals are still improving. We're not in another recession, and we're certainly nowhere near the recession/depression fears that are embedded in 10-yr Treasury yields and S&P 500 PE ratios of 13. 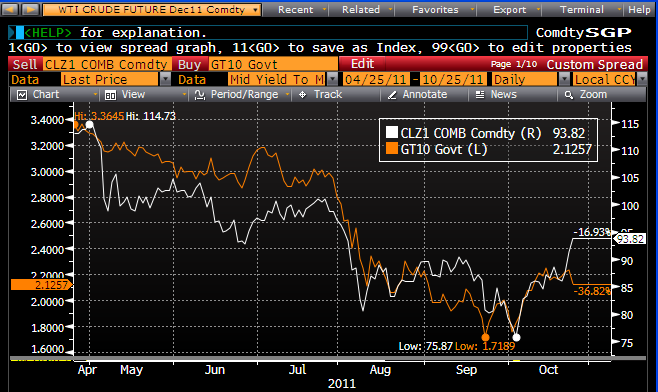 This chart compares the yield on 10-yr Treasuries to the price of crude oil futures contracts. The two have been moving in tandem (correlation 0.92) for awhile now, but today's action caught my attention: crude is up sharply, while yields are down (and bond prices are up). That the two should move together makes sense, since both have been driven of late by perceptions of the economy's strength: a weaker economy calls for lower yields and less demand for oil, and thus a lower oil price. What to make of the opposite moves today? 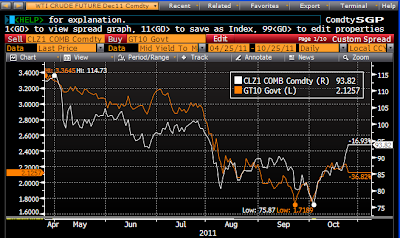 I'm tempted to think that Treasury yields today have zigged when they should have zagged. Drudge today reports that "Home prices tumble again," but that is a wild exaggeration. 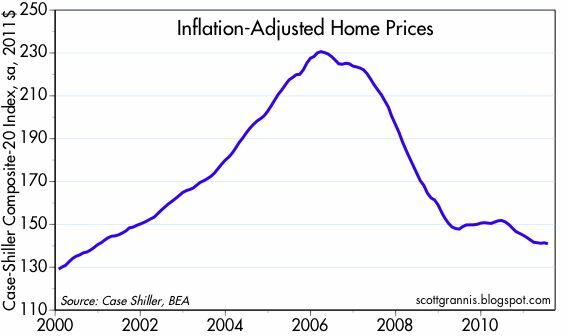 These charts help put things in the proper perspective: prices haven't dropped much at all in the past few years, but they are substantially lower today than they were at the peak of the market in 2006. The Case Shiller home price index for August shows that average prices in the major 20 metropolitan markets are unchanged relative to where they were at the bottom of the recession in 2009 (top chart). On an inflation-adjusted basis (second chart), prices have fallen 40% from their 2006 highs, and are down about 6% relative to where they were at the bottom of the recession. In the top 10 markets (third chart), real housing prices today are about 15% higher than they were in late 1989, and about 50% higher than they were at the lows of 1997. 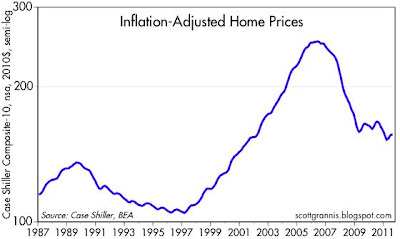 This latter observation could support the claim that prices have not yet hit bottom, but I note that mortgage rates in 1997 were about double what they are today, and real personal incomes are 37% higher than they were in 1997—so today's housing prices are much more affordable than they were in 1997. 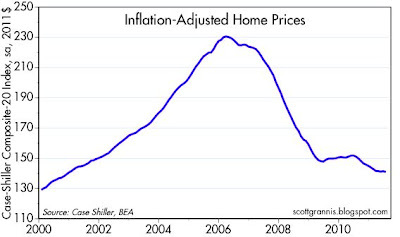 The case for a further sharp decline in housing prices is not obvious, in other words. But, you say, what if mortgage rates were to rise? Wouldn't that kill the housing market? Not likely, because mortgage rates would likely rise only if the economy were to strengthen and/or inflation were to rise, and that would mean much stronger demand for housing. Moreover, stronger housing demand in coming years would also likely collide with a dearth of new housing construction, thus creating very strong upward pricing pressures on housing. The best thing about the Republican debates has been that they have proved to be a breeding ground for good ideas. Cain's 9-9-9 plan has been received very enthusiastically, catapulting him from a nobody to a serious contender, and today Rick Perry has improved on the idea with his 20% voluntary flat tax. I should note, however, that Perry has borrowed very smartly from Steve Moore's visionary Alternative Maximum Tax, which he proposed way back in 1997. Steve Moore, whom I first met at a Cato conference in the early 1990s, and who went on to lead the hugely influential Club for Growth, had a brilliant idea: make the switch to a flat tax voluntary. Let people pay a flat tax rate (Steve originally proposed a 25% flat tax) that was somewhat more than what the average effective income tax rate was at the time, in exchange for being able to fill out their tax forms on a postcard, while also forgoing all the expense of hiring accountants and lawyers to maximize the value of deductions. Steve's plan had the great virtue—as does Perry's plan—of greatly simplifying the tax code, broadening the tax base, and thus maximizing the pro-growth incentives of a lower marginal tax rate. Plus, it made the transition to a completely different tax code relatively painless: let people decide which tax system they wanted to follow, just as Jose Piñera had the vision to make Chile's privatized social security reform voluntary. The best system will in the end win out, as has Chile's privatized social security reform. I'm not picking candidates at this point, but I am pointing out that we now have some very, very interesting solutions being proposed to our nation's fundamentals problems, and this is extremely positive. You haven't heard the end of this—only the beginning, and it just promises to get better. Let the best man win! Moody's today reported that their August index of commercial property prices rose 2.5% from July. 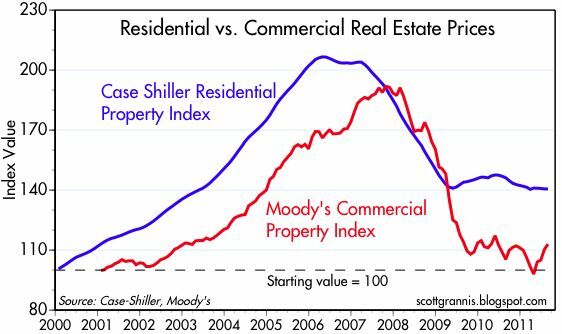 As the chart above shows, that means commercial property prices have been flat for the past two years. Bloomberg's index of home builders' stocks shows that the fears coming out of Europe scared the bejeesus out of the real estate and construction market, driving prices down to the lowest levels since March 2009. 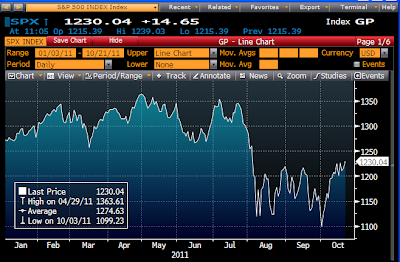 Markets were braced for some really awful news on the U.S. economy which has failed to materialize. 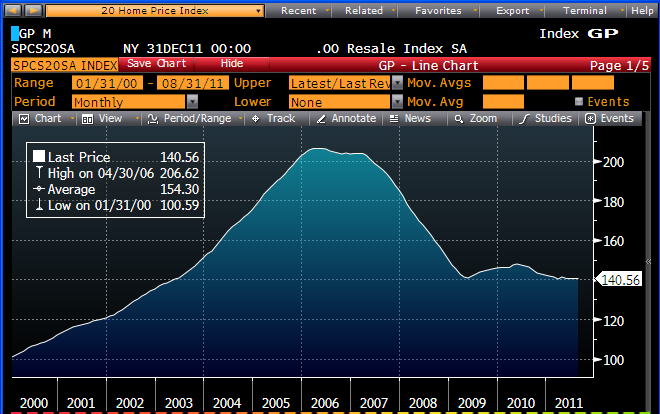 Instead of collapsing real estate prices, we see flat prices. Once again, I emphasize that the recent increases in the prices of risky assets are not being driven by optimism, but rather by a decline in pessimism. UPDATE: I've replaced the first chart with an updated version to include the latest Case Shiller home price data (through August). The net result is substantially the same: prices are flat. Since July it's been obvious that the Eurozone debt crisis was seriously impacting U.S. financial markets, creating the fear that a Eurozone financial meltdown could spread to the U.S. and ultimately trigger a global depression/recession. A brief recap of how all these things have played out is in order, especially since there are signs that the panic may be subsiding, at least in the U.S.
Eurozone swap spreads first started jumping in June, and have since reached levels that signal real panic and unquestionably high systemic and counterparty risk. 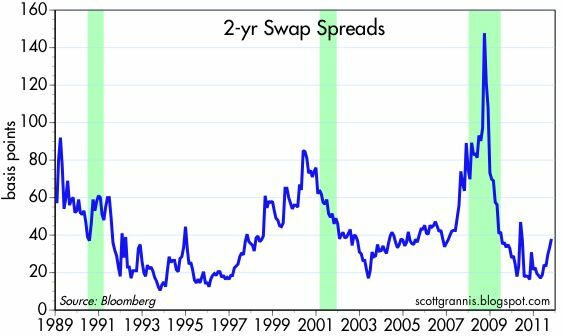 U.S. swap spreads, in contrast, have risen only marginally and remain at levels that are within what might be called a normal range (2-yr swap spreads are currently 36 bps). The gap between Eurozone and U.S. swap spreads was a very good indication that while the troubles in Europe threatened to become contagious, the U.S. economy was not yet experiencing any significant deterioration. 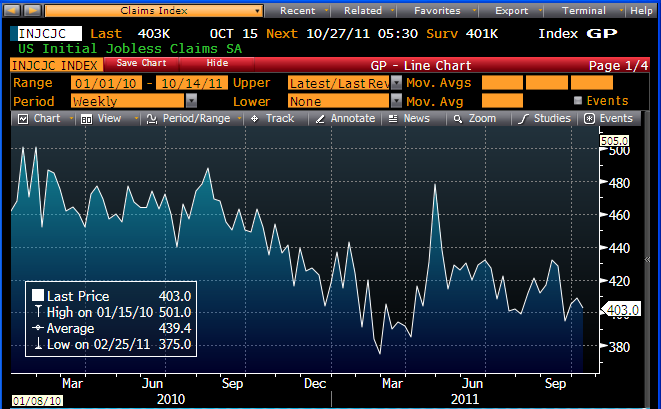 That's been clear from a variety of high-frequency indicators, such as weekly unemployment claims. Claims have been slowly declining since June, and are down considerably from last year's highs (see first chart above), and private sector payrolls have continued to expand. 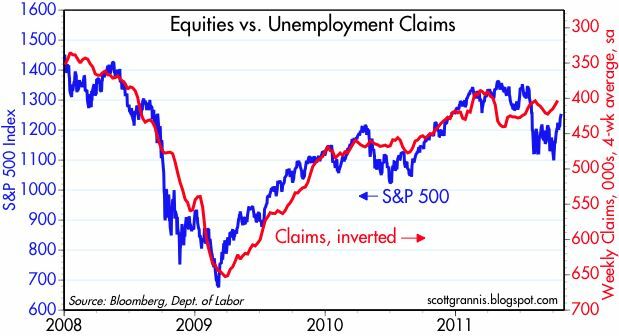 The trend in claims also matches fairly closely the progress in the S&P 500, as illustrated in the second chart above. 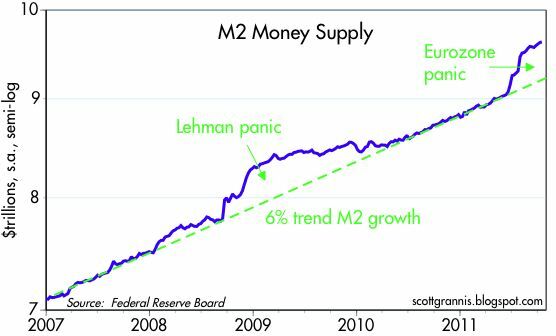 The U.S. M2 money supply started rising significantly in June, reflecting what appears to have been a flight to safety out of Eurozone banks, which I calculate amounted to about $400 billion. 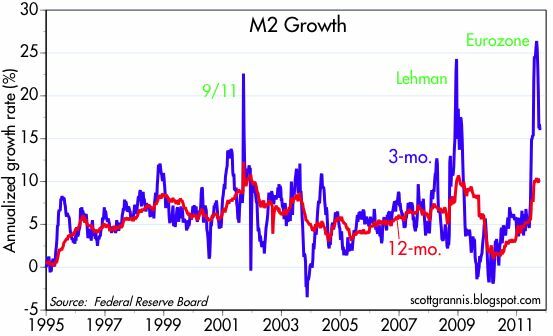 But in recent weeks M2 growth has reverted to something more normal. As the chart above shows, there has been a very tight correlation between the Eurozone stock market (orange line) and 5-yr Treasury yields. 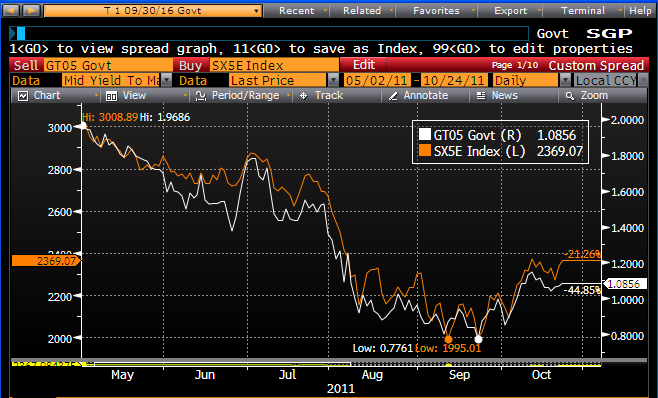 As the panic in Europe intensified, financial markets sought the safety of short-term Treasuries. 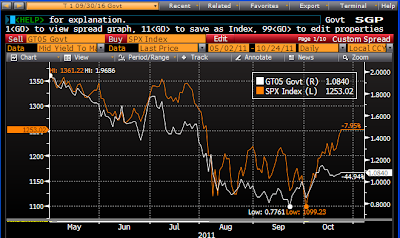 As the fears have diminished somewhat, stocks everywhere are rising and 5-yr Treasury yields are also rising. Contrast the chart above with the second chart above, and you see how U.S. stocks (orange line) have been less affected by the panic than European stocks, and not as tightly correlated to 5-yr Treasury yields. Europe remains depressed, but the U.S. economy is doing much better than many had feared: the S&P 500 has outperformed the Euro Stoxx 50 index by 30% since the beginning of May. A collapse of the Eurozone financial market and economy could still occur, of course, and if it does it could have a significant negative impact on the U.S. economy. But in the meantime the U.S. economy is continuing to slowly improve and our financial markets are reasonably healthy. 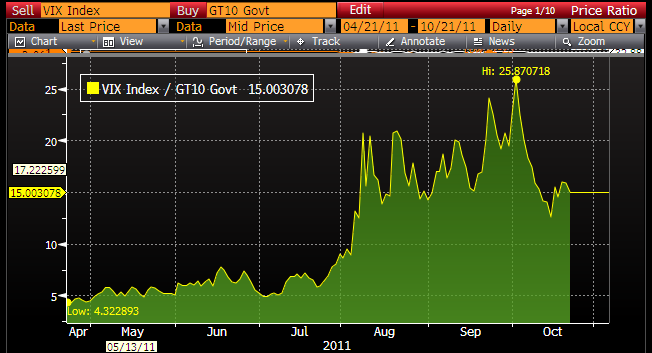 The world has known that a Greek default was essentially unavoidable for many months now, and prices are braced for the worst. Markets have been priced to the expectation that the U.S. was on the cusp of another recession, but it hasn't happened yet and I see no signs that it will. In the absence of evidence to confirm the market's fears, risky asset prices have little choice but to float upwards. 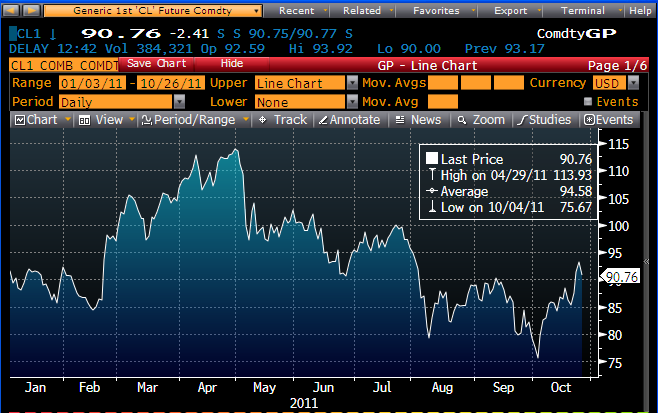 Today saw a rather depressing milestone: the dollar has hit a new all-time low against the yen. 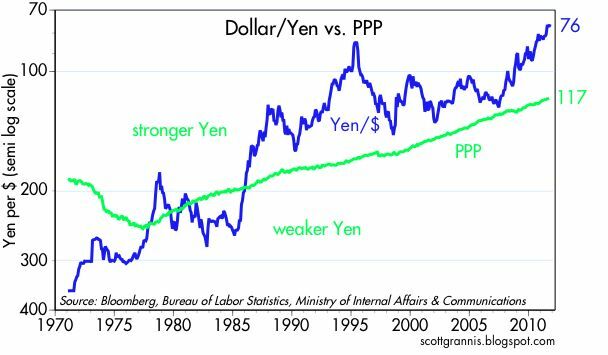 This chart helps explain why: the yen's long-term appreciation against the dollar has been largely driven by the fact that inflation in Japan has been much lower than U.S. inflation since the late 1970s. According to Japan's Nationwide General Price Index, prices are on average at the same level today as they were in March 1993. 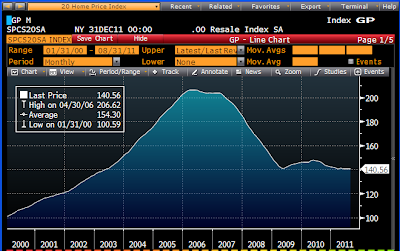 Meanwhile, over that same period, the U.S. Consumer Price Index has risen by 58%. This alone would account for a 58% appreciation of the yen vis a vis the dollar since 1993, since that is what would be required to keep prices stable between both countries (if the yen/dollar exchange rate had not changed, U.S. prices would have risen 58% relative to Japanese prices). So its not surprising to find that the yen has risen about 50% against the dollar since then. 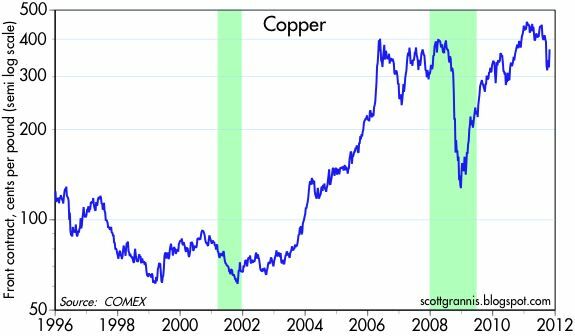 The green line in the chart above shows how the value of the yen should have moved over time in order to keep price levels constant between the U.S. and Japan. 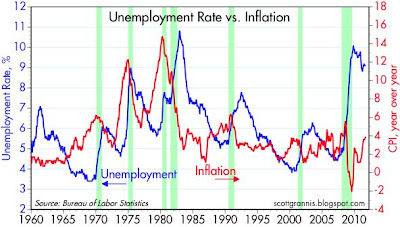 It moves consistently higher because U.S. inflation has been consistently higher than Japanese inflation. The fact that the current exchange rate is 76 yen/$, while my calculation of Purchasing Power Parity is 117 yen/$, is one way of estimating how strong the yen is. I figure it's about 50% "overvalued" relative to the dollar, which means that a U.S. tourist in Japan would find that, on average, things there cost about 50% more than they do in the U.S. This is also an indication of how little confidence the world has in the underlying fundamentals of the dollar relative to the yen. The stock market has made a nice comeback since the gut-wrenching lows of October 3rd. Are we out of the woods? Not yet. We still need to see what happens in the aftermath of the inevitable Greek default, and many are not convinced at all that the U.S. economy is going to avoid a double-dip recession. 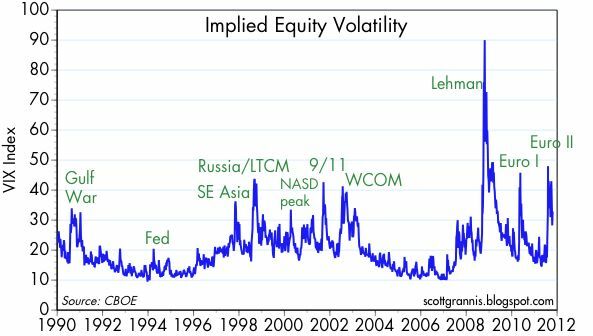 The following charts recap just how nervous the market still is. The rally this month has not been driven by optimism; equities are up because things haven't been as bad as the market had been expecting. 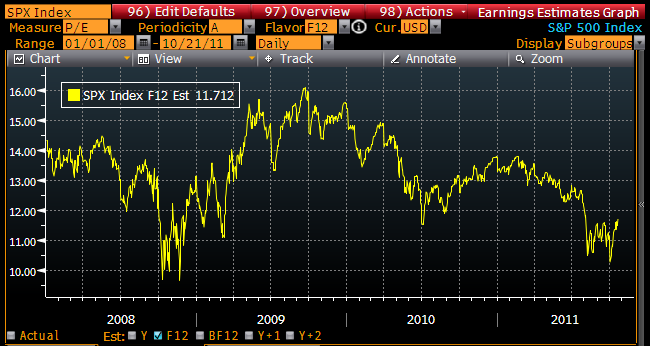 This chart shows the consensus 1-yr forward PE ratio of the S&P 500. 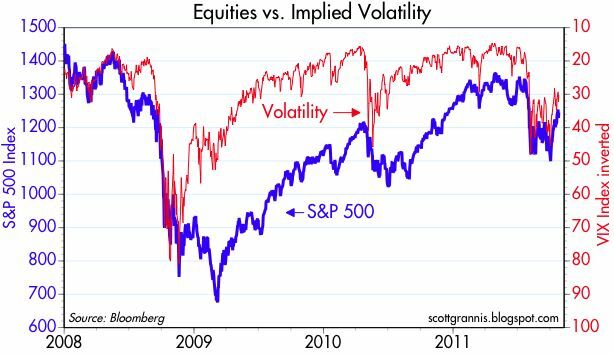 Multiples are almost as low today as they were during the total panic that gripped the market in the fourth quarter of 2008. By this measure, the market is still terrified of the future. 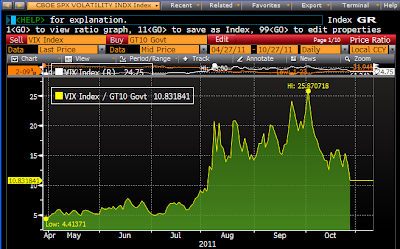 The first chart above shows the ratio of the Vix index of implied equity volatility to the 10-yr Treasury yield. The second shows the Vix Index in an historical context, and the third chart shows the 10-yr Treasury yield in an historical context. The Vix index is a good proxy for the market's fear and uncertainty about the future, since it measures how cheap or expensive it is to buy options that limit one's risk. 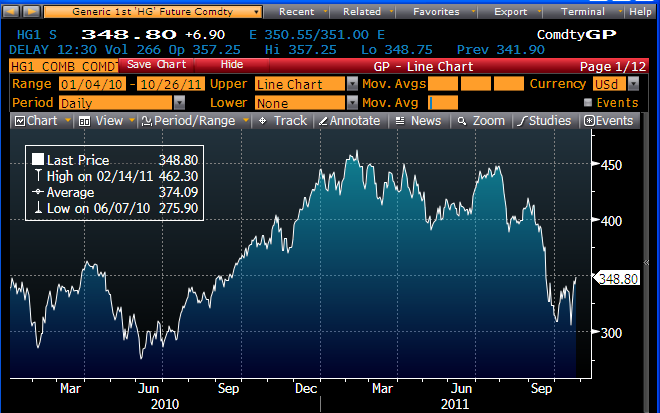 At today's level of 32-33 it is not hugely elevated, but it is almost three times its long-term average. 10-yr Treasury yields are only inches from their all-time low, and that is a good proxy for the market's expectations of future economic growth—which are just plain dismal. 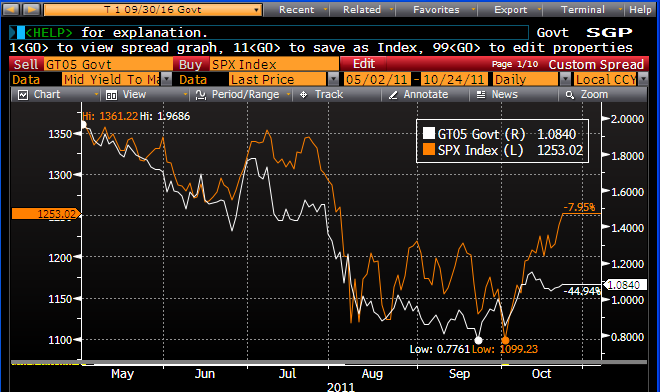 The ratio of the two shows that fear is high, uncertainty is high, and economic growth expectations are extremely low. 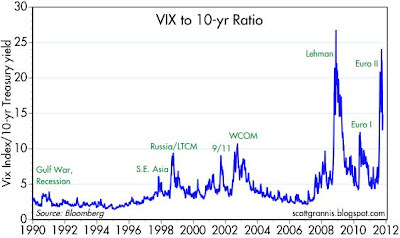 This long-term look at the Vix/10-yr ratio sums it up: at today's value of 15, the psychology and expectations underlying the market rank right up there with the worst we have seen in the past 20 years. High-yield, option-adjusted credit spreads are about 150 bps off their recent highs, but as this chart shows, they are still very elevated from an historical perspective—still consistent with levels that have been associated with recessions in the past. The market, in other words, is braced for a recession. By this measure, however, the expected recession is not nearly as bad as what was feared at the end of 2008. 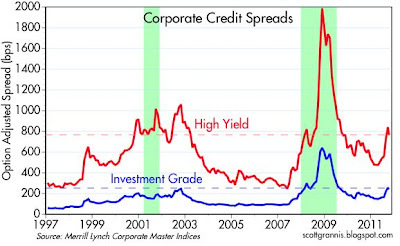 This provides some solace, but it remains the case that the market is priced to very bad news. As the first chart above shows, 2-yr swap spreads—an excellent and forward-looking indicator of systemic risk, market liquidity, and financial market health—are up a bit from their recent lows, but from a long-term perspective they are still within the range of what might be considered "normal." This provides a huge measure of comfort in my view, since it means that our banking system and financial markets are still fundamentally healthy. As the second chart shows, however, swap spread in the eurozone are still very high. Eurozone financial markets are extremely worried about the solvency of their banking system, and about the fallout from one or more sovereign debt defaults. As I have been arguing for many months, Europe is the primary source of the fears that are weighing so heavily on U.S. markets. So it's all a big waiting game right now. When will Greece finally default? How will it be managed? Will other countries be tempted to follow suit? 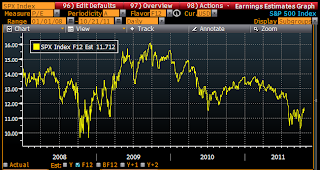 Will European bank balance sheets and capital ratios be able to withstand the losses? 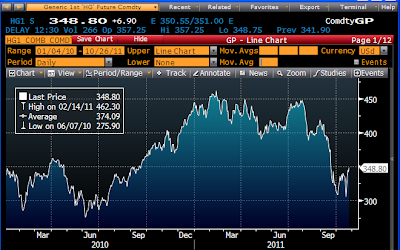 Will there be a contagion effect to U.S. banks and to other financial markets around the globe? Will economies take another nose-dive? No one has the answer to these questions of course. But markets are braced for a very unpleasant and possibly catastrophic outcome. If the denouement of the sovereign debt crisis results in anything less that a deep and prolonged global recession, the chances are good that risk markets could stage an impressive rally. And anyway, the world has been worrying about this for the past 18 months, so it can't possibly be the sort of "black swan" event that comes out of nowhere and catches markets completely off guard. I think there is still lots of room for optimism these days, considering the rampant pessimism that is still pervasive in almost every market. Further to my post of yesterday, here are some more measures of the shape of the yield curve. We know the Fed is trying to manipulate the bond market, first by QE, and second by Operation Twist. So it's possible the yield curve could be sending false signals. But I am of the belief that while the Fed can absolutely control short-term interest rates (it's policy target is the overnight rate), it has very little control over the yield curve from 5-10 years and out. That's because longer term interest rates are determined by inflation fundamentals and market expectations of what the Fed will do in the future. Today, we know the Fed can't stay at zero forever; at some point the economy will pick up and the Fed will begin increasing short-term rates. 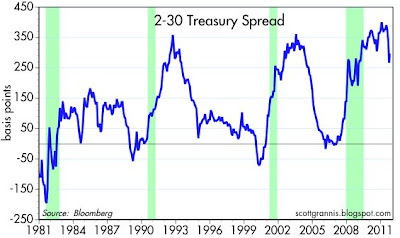 Looking at the forward Treasury curve, we see that the market expects 3-mo. T-bill rates to rise from zero today to 0.71% in two years. 2-yr Treasury yields are expected to rise from 0.3% today to 1.3% in two years. 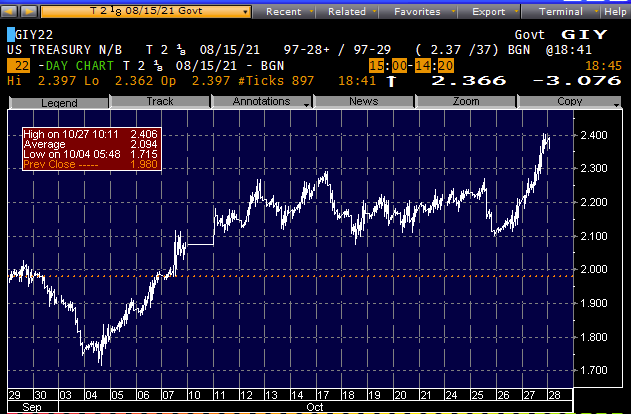 5-yr Treasury yields are expected to rise from 1.1% today to to 2.2%. 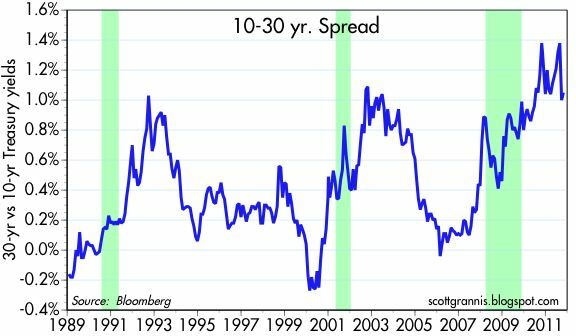 In short, a positively-sloped yield curve is driven by the expectation that short-term rates will rise in the future. That is always the case when the yield curve is positively-sloped. As the top two charts show, despite the Fed's attempts to depress long-term interest rates, the curve out to 30 years remains very steep by historical standards. That is fully consistent with the expectation that the economy will improve. It is not at all consistent with the view that we are on the cusp of another recession. 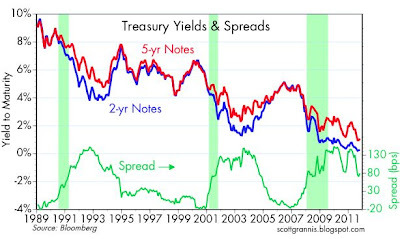 If the latter were the case, the yield curve would be flat, especially in the 2-5 area. Yet even that part of the curve, where Fed expectations are very strong drivers of yields, the curve still has a definite positive slope. No matter how you look at it, the market fully expects things to improve in the future, not get worse. The slope of the yield curve has been a good indicator of the headwinds facing the economy: a flat or inverted curve is a sign of tight monetary policy and a relative shortage of liquidity, while a positively sloped curve is a sign of easy monetary policy and an abundance of liquidity. 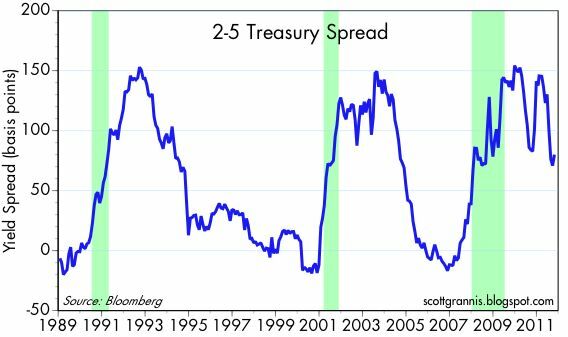 This chart looks at the slope between 2- and 5-yr Treasuries, and there is no indication here that the economy is facing any serious monetary headwinds. The Fed may be up against the zero boundary for short-term rates, but the market expects that the Fed will be raising rates over the next several years. 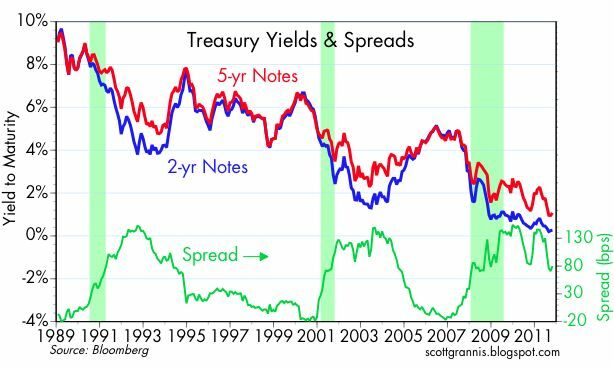 This chart looks at the spread between 1- and 10-yr Treasuries, and the message is the same: the yield curve is plenty steep and non-threatening. It also shows the real Federal funds rate (using the PCE Core deflator), which is another way of measuring how easy or how tight monetary policy happens to be. By this measure, monetary policy has rarely been this easy. 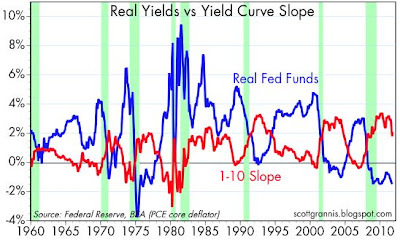 Every recession in the past 50 years has been preceded by a marked flattening of the curve, and all business cycle recoveries have been accompanied by a relatively steep yield curve and relatively easy monetary policy. Conclusion: key indicators of monetary policy show absolutely no threat to continued economic growth. The Misery Index has been rising since 1998, due mostly to rising unemployment, but also due to rising inflation. It has now reached the levels that prevailed in the early years of the Carter presidency. 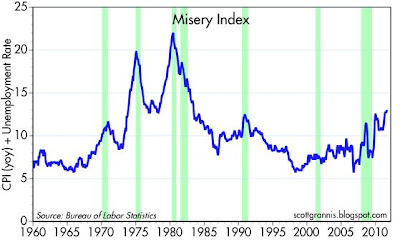 The top chart recaps the Misery Index, while the bottom chart shows its components.